From the original 110 teams, the top seven teams will be invited to pitch at the Investor Pitch Finals. 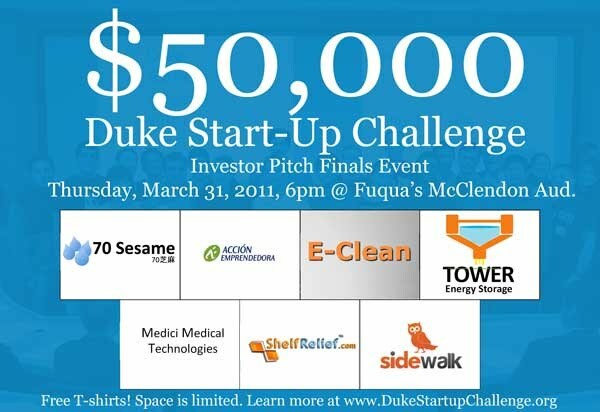 Join us at the event to watch the teams give their final investor presentations and compete for the $50,000 Grand Prize. And Melissa Bernstein '87, Co-founder/Co-Owner of Melissa & Doug will be our keynote speaker for the night. Get to know Melissa a little bit by reading our interview. In addition, the judges will provide live feedback after the event, to help educate students on the thought processes of experienced business executives. This will be a rare and exciting event that will educate and inspire aspiring student entrepreneurs. Don't miss this event! Accion emprendedora will offer business management education, training and coaching for Hispanic entrepreneurs in North Carolina to help them overcome the barriers they have for growth and economic development. Reducing hospital acquired infections (HAIs) through increased hand hygiene compliance. The HyTower pumped-hydro system builds on proven technology to deliver safe, reliable energy storage at higher efficiency and lower cost than competing technologies into a growing $1.5B annual market. Medici develops innovative devices to restore control to women suffering from urinary incontinence (UI). 28M Americans suffer from UI and most see little improvement in their conditions, despite $20B spent annually on this problem. The best way to buy and sell books among college students. Sidewalk is a tool for local businesses to increase customer traffic. Sidewalk makes it incredibly simple for local merchants to publish time-sensitive deals. All Duke students, post-docs, staff, alumni and faculty are welcome to attend.